When last we saw Ron Burgundy (Will Ferrell), that polyester paragon of old school TV news, he was resisting the changing feminine face of his medium in the 1970s. In Anchorman 2: The Legend Continues, he’s among the vanguard of the all-day news network and the ultimate dumbing-down of that same medium. That premise makes for a good half-hour or so of script material; the rest of Anchorman 2 is the sort of extraneous padding that comedic performers like Ferrell and Adam Sandler ultimately have the unfortunate clout to foist into their movies. This sardonic framework culminates during the film’s final act with a madcap battle royale between various spinoff news channels, a parade of horribles embodying the media oversaturation that Ron’s bright idea would ultimately bring about. The scene’s cavalcade of cameos might smack of a narrative crutch. But, it breaks the monotony and, in the case of an appearance by a certain Canadian comedian, shows what a true physical funnyman can do with even the barest material. Unfortunately, it’s also a scene that encapsulates everything good and banal about Anchorman 2. While the specter of a fight to the death between warring tribes from the BBC, MTV, E! and History Channel is hilarious, the incongruous inclusion of a werewolf, minotaur and the ghost of Stonewall Jackson is the sort of pointless surreality that populates rest of the film. Too much time is spent on what Brick, Champ and Brian were doing with their lives before Ron gets the band back together. Same with an utterly unfunny subplot involving Brick’s non sequitur-filled flirtations with fellow oddball Chani (Kristen Wiig)—a little Brick goes a LONG way. When Ron is abruptly afflicted with blindness (too complicated to explain here), Ferrell’s otherwise droll portrayal of Ron’s self-pity party strays into stagnant waters, particularly when Ron and his son nurse-feed an injured shark they name Doby back to health. Even the structure of two verbal gags was lifted from the Austin Powers movies. And then there are the lunkheaded attempts at off-color humor, which Ferrell and director Adam McKay include without an ounce of wit. Hearing Ron, Champ and others constantly refer to “blacks,” “Mexicans,” “lesbians,” and “Jews” isn’t brazenly non-PC, it’s just uncomfortably icky without sufficient satirical context. The ebb is Ron’s affair with Linda (Meagan Good), his feisty African-American producer, mined for race-centric riffs that include a Guess Who’s Coming to Dinner scene in which Ron adopts an exaggerated black-cent in order to communicate with Linda’s otherwise erudite family. 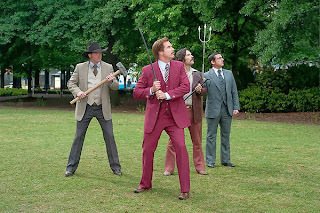 Anchorman 2 is 15 minutes longer than its predecessor, but it feels like 50. Trimming a half-hour of self-indulgence would have left a solid, even subversive satire. As it is, this is one anchorman that desperately needs a copy editor.